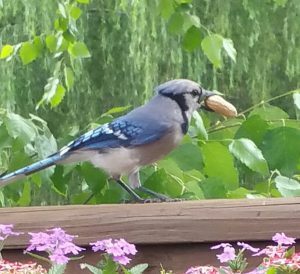 I have really been enjoying my backyard birds lately. 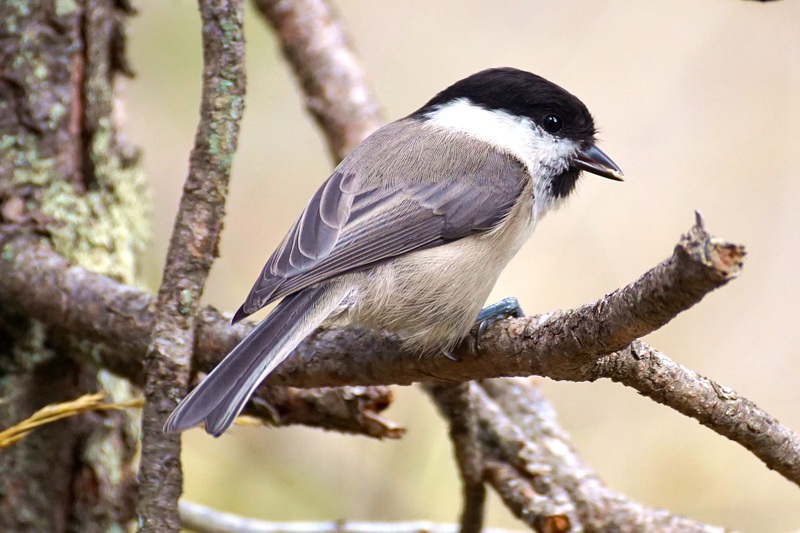 Carolina Chickadees, Carolina Wrens, Tufted Titmice, Downy Woodpeckers, Red-bellied Woodpeckers, Blue jays, Cardinals, Goldfinches, Ruby-throated Hummingbirds, and even the Cooper’s Hawk have been very enjoyable to watch at my feeders and in the surrounding trees in my yard. Did you notice that there aren’t any blackbirds mentioned on this list. Exactly! It is because they have mostly left for the season which was about three or four weeks ago. Now that is a good thing! Don’t get me wrong, I really enjoy listening to and watching Red-winged Blackbirds around my property with their high-pitched call and their beautiful red wings in the sunlight. I do not even mind the Grackles too much as they are not too bothersome. Only when a big flock comes in and they take over the feeders do they bother me. That doesn’t happen near as much as when Starlings drop in. Those birds are just plain pests and so very messy! So where did all the blackbirds go? Do blackbirds migrate? Yes, of course they do at least in my neck of the woods here in Kentucky. The birds where I live move further down in the United States and into Mexico. Some blackbirds can be year round residents in parts of their range depending on food supplies. So it all depends on where you live. Around late July, early August when breeding season is over blackbirds start to gather in flocks. As these birds migrate south they join even bigger flocks sometimes in the thousands or more, feeding on open grounds eating grain mostly to store fat for the winter months. 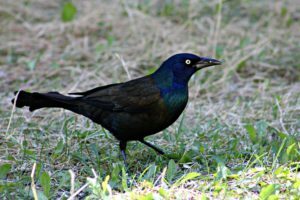 Some of these flocks of blackbirds may be all one species but others could contain multiple species such as Red-winged Blackbirds, Starlings, Grackles, Cowbirds, and sometimes Rusty Blackbirds if you look hard enough. They do not mind gathering in numbers because in numbers there is power. What do I mean by this? Well when birds are in such large groups it is harder for predators to pick a single bird out of the flock. Blackbirds also cooperate together to find and provide food for each other. In addition, these huge flocks of birds find places to roost for the night together. In colder weather this grouping together provides warmth. Note: Blackbirds do not stay in these huge flocks all year round. During breeding season they break in to smaller groups. For example, in spring and summer the Red-winged Blackbirds are a common sight around our pond. There could be thirty or more birds around at one time hanging out in the cattails. That is because they breed close to each other in groups. It is said to be mostly with Starlings but other blackbirds can be included. A murmuration is when huge flocks of blackbirds move in unison with each other swirling and shifting, covering the sky in a sort of black cloud. I’m sure you have seen this before. I have seen them while traveling on the expressway. All these birds flying in what seems to be synchronized movement in the sky. It really is an amazing sight to see and hard to believe that these birds are capable of doing this. 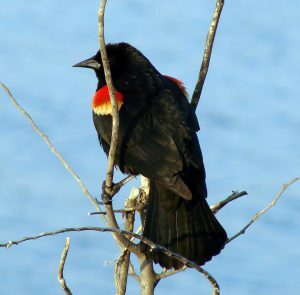 Red-winged Blackbird – they are one of the most abundant blackbirds in North America. Their breeding habitat is around wetlands, marshes, and ponds. They can be seen around the reeds of cattails or tall grasses where they like to build their cup-shaped nests made of grass, leaves, and/or reeds. Males may breed with more than one mate at a time within a small colony of other Red-winged Blackbirds. 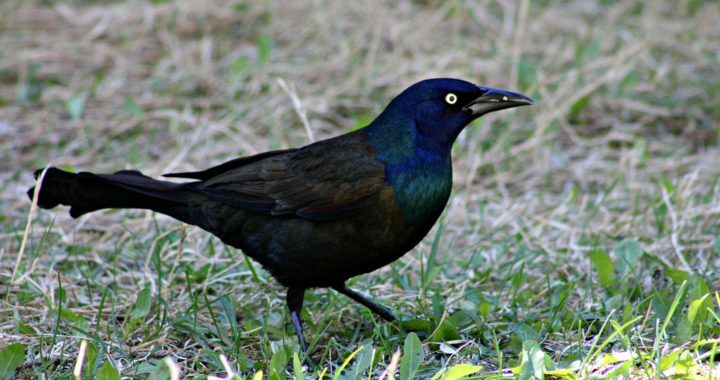 Common Grackle – can be found in suburban backyards, around farmland, around marshes and streams. They like to nest mostly in evergreens found in parks, backyards, open woods. This blackbird also likes to nest in small colonies of up to thirty or more pairs. European Starling – this blackbird is common throughout the United States. A pest for sure and can be found in the city, in the suburbs, and on farmland. This is a noisy bird that likes to take over feeders making messes everywhere. It will nest anywhere in any kind of cavity that will suit the bird. 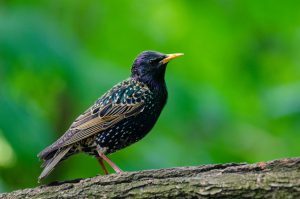 The European Starling is not native to the United States. It was brought over by Shakespeare and introduced in New York City in 1891. It started out with forty one birds that were released there and has grown to over two hundred million of these birds found throughout North America. 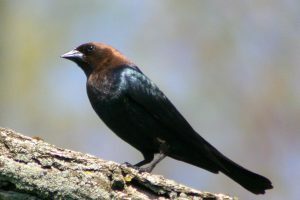 Brown-headed Cowbird – these blackbirds are found throughout North America and are actually native birds. However, they can be a very invasive species. They do not build their own nests but lay their eggs in the nests of other birds. A female may lay up to forty eggs in a breeding season. Now that is not good! In late July, early August blackbirds usually begin leaving their summer breeding grounds to gather in large flocks. As these birds leave their summer homes up north and move southward they continue to gather into huge flocks which can be in the thousands or more. There is power in numbers for sure. They work together to find and provide food sources for each other, to keep warm in cold weather as they roost together, and to ward off predators. Hawks and falcons have a harder time picking one of these birds out when they are in tight groups. Seeing a huge flock of blackbirds is always an amazing sight too. Just as long as they are not dropping down at my feeders in the dead of winter and taking over my birdfeeders ;-). Do you have anything that you would like to add to this post? Please feel free to make your comments below. Posted in Backyard Birds, Bird Feeders and tagged blackbirds, cowbird, grackle, redwinged blackbird, starling. ← When Do Birds Migrate South?